Some of our favorite super easy-to-make drop cookie recipes for Mint Chocolate Chunk Cookies and Fresh Mint Chocolate Chip Cookies. Why are they so easy? There's hardly any measuring of ingredients and mixing is a breeze because you start with sugar cookie mix. 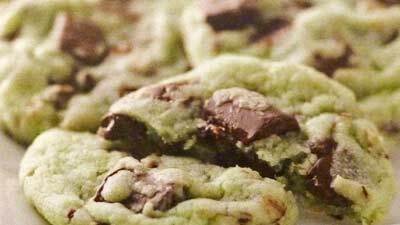 The mint flavor for the chocolate chunk cookies comes from two popular cooking inredients: mint extract and crème de menthe baking chips. Whereas the mint chocolate chip cookies use both fresh mint leaves along with mint chocolate chips to achieve its great flavor. These tasty mint chocolate chips cookies are cool and refreshing and would be great on a hot summer afternoon with a cold glass of iced tea or lemonade. Many mint extracts are a combination of spearmint and peppermint. If you prefer the taste of peppermint over spearmint in your cookies, you may want to ensure you are using pure peppermint extract . Preheat your oven to 350F degrees. Line baking sheets with parchment paper, silicone liners, or use ungreased cookie sheets. In a large bowl, stir sugar cookie mix, butter, mint extract, green food color and egg with large wooden spoon until soft dough forms. Stir in crème de menthe baking chips and semisweet chocolate chunks. Drop dough by teaspoonfuls onto prepared cookie sheets about 2 inches apart. Remove from the oven and allow cookies to sit on sheet for 3 minutes before transferring to wire rack to cool completely. 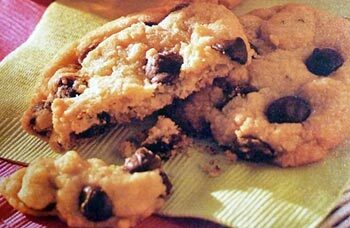 This recipe yields about 36 Mint Chocolate Chunk Cookies. Feel free to substitute 1/4 teaspoon mint extract for the chopped mint leaves in this recipe. Preheat oven to 350F degrees. Line baking sheets with parchment paper, silicone liners, or use ungreased cookie sheets. In a large bowl with an electric mixer on medium speed, beat sugar, butter, mint and egg until well combined. Stir in flour, baking soda and salt; stir in mint chocolate chips. Drop dough by rounded tablespoonfuls about 2 inches apart onto prepared cookie sheets. Bake 11 to 13 minutes, or until golden brown. Remove from the oven and allow cookies to sit on sheet for 1 to 2 minutes before transferring to wire rack to cool completely. For Mint Raspberry Chocolate Chip Cookies use raspberry chocolate chips instead of mint chocolate chips.